Most window shutters are decorative. They are put on the house because they look good, not because they protect the windows from the storms. As a result some architects and builders get a little sloppy. In other cases it is the homeowner at fault. They put up shutters that aren’t appropriately sized for the window. The result is a window that looks awkward. You may not be able to identify what looks wrong, but you get an uneasy feeling when you look at the house. The problem is minor, but since the shutters are often a contrasting color, this minor problem often has a major impact. The sizing problem can occur in two dimensions. The shutters need to be a little taller than the windows. Most houses get this right. The shutters also need to look like they would cover the windows if closed. This is a little tricky since you could have bi-fold shutters that take up half of the width that the cover when opened. Thus even a real shutter may not be half the width of the window, but they should be some even multiple of the window’s width, plus a little bit so that the overlap the frame. Thus a window that is 40 inches wide should have shutters that are just over 20 inches wide, or just over 10, but they shouldn’t have shutters that are 15 inches wide. Does this really matter? Well, probably not if you are close, but if the difference is severe enough that the eye can pick it out, chances are it will look a little awkward to some people. These are my shutters on my window. They are definitely wrong. Here is my confession. My house has shutters like this. They are the ones on this page. I know I should replace them, but I also want to reside the house, re-insulate, and do a host of other things that should be done all at the same time. So, like I have been for the last 14 years, I am waiting until I have the time and money. Want to see a great article on shutters? Check out what Ken the Old House Guy has to say on this subject. 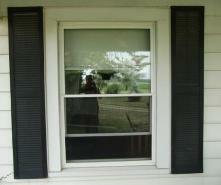 For the record the shutters on the window pictured are 14.5 inches wide. The glass on the window is 38 inches wide. The distance between the shutters is 54.5 inches wide. There is no way that shutters this size are appropriate for this window. Closing the shutters (if they weren't fake) would leave a huge gap. One problem I have with these windows is the wide frame they put around the windows when they sided the house. It is awkwardly wide. So any solution to my shutter problem should involve moving the shutters in closer to the glass. The shutters also seem unnaturally tall, since they are sized to match the wide frame. So fixing the shutter problem requires a change to the frame, which will have to wait until I re-side the house. An alternative is to remove the window shutters. My house is a four-square home with a general Craftsman feel. Craftsman homes generally lacked window shutters, so I’d be on solid ground to forego them. On the other hand these foursquare homes are common around here and most have shutters. I think, perhaps, with a little color to the house the structure won’t seem so plain and the house will look good without the shutters. Now, if I can just scrape the money together to re-side my house.